Karen K. Engel, 64, of Fayetteville and a former resident of West Hartford, CT died peacefully Saturday June 17, 2006 at St. Josephs Hospital in Syracuse after a valiant effort to deal with a long illness in a positive manner. Her community and religious activities were a great source of inspiration to others. She was a 1963 graduate of Russell Sage College and worked in market research for Time Life in New York City, Xerox Corporation, and Knowledge Systems and Research. Mrs. Engel was the past President of the Lupus Foundation of CNY, past President of the Upstate Medical Center Auxiliary, where she was instrumental in developing the Ronald McDonald House and Childrens Miracle Network Telethon. She was co-founder of the Concord Aces Bridge Group that has met weekly since 1972, a sustaining member of the Junior League where she co-chaired the Whale Sale and a member of the Suburbanites Duplicate Bridge Group. She was also a member of Temple Society of Concord, a past member of their Board of Directors, and past President of its Sisterhood. In 2000 she received a Congregational Award for her years of dedicated service. She was Co-President of the Jamesville-Dewitt Chapter of AFS International and Intercultural Affairs. In addition, Mrs. Engel was a member of Lafayette Country Club, Cavalry Country Club, New York Thoroughbred Breeders Association and a former member of the Corinthian Club. 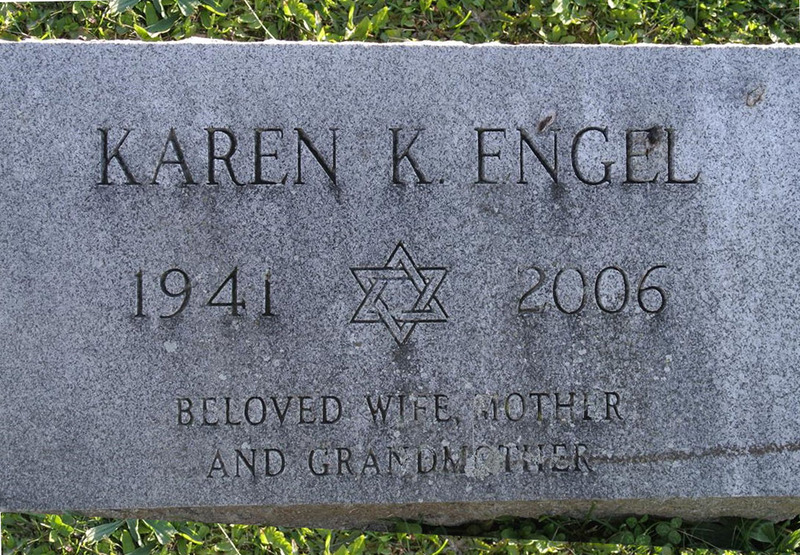 With her husband, she co-founded the Engel Family Fund at the Temple Society of Concord to assist individuals in need and the Karen and Richard Engel Equal Access Fund at the Yale Law School to aid students with disabilities. She was an avid and enthusiastic owner of slow thoroughbred horses for nearly thirty years and summered in Saratoga. Survived by her husband Richard L. Engel, sons Todd S. (Dawn) Engel and Gregg M. (Beth) Engel, grandchildren Geoffrey and Nicole Engel, a brother Mark (Betsy) Kutner and numerous cousins, nieces and nephews. Services will be conducted at 2:00 p.m. on Tuesday, June 20th, 2006 at Temple Society of Concord, 910 Madison Avenue. Friends may call on Tuesday at the Temple from 12:30 to 2:00 p.m. Burial will be in Frumah Packard Cemetery. Contributions may be made to the Engel Family Fund at Temple Society of Concord.